I used to work as a wedding planner so I chose Yusuke Asada since we had worked together before. Many photographers are often very cookie cutter in a sense that they are very "clean" and take very run of the mill photos. But Yusuke on the other hand, has an eye for unique and original pictures and that was what we were looking for. No matter where we decided to have our pictures done, we knew we wanted candid but unique photos. Did you have a pre decided theme for your photo shoot? 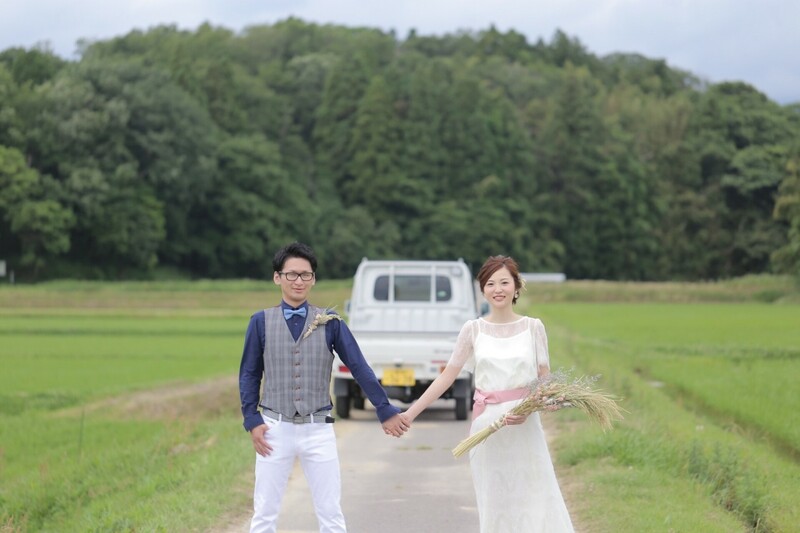 My husband to be's family are farmers — rice farmers! So we decided on having a "farmer's wife" theme. He was more set on this theme than I was actually (haha). 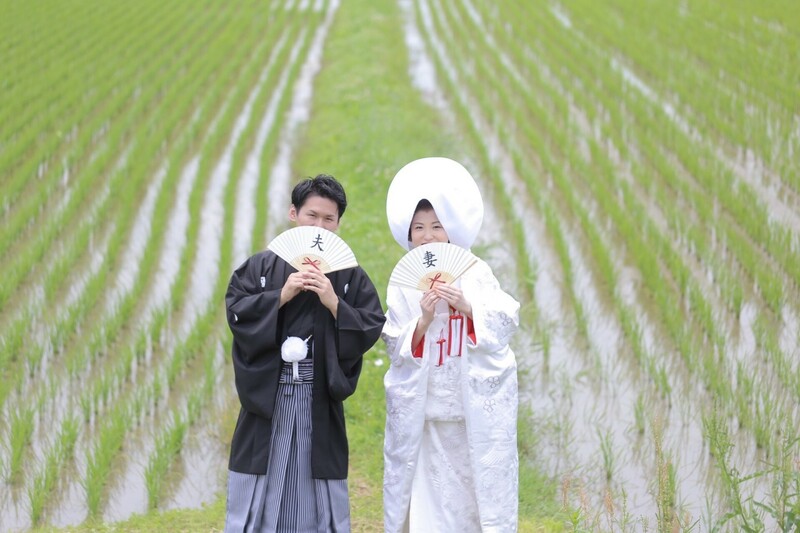 Originally, we wanted to have the photo shoot in August since that is the best time for the rice fields and that is when they are the best looking but we thought it would be a bit too hot so we decided to have the shoot in June instead. Though the rice seedlings only have a little growth at this time it is a lot cooler so much better for our outfits. 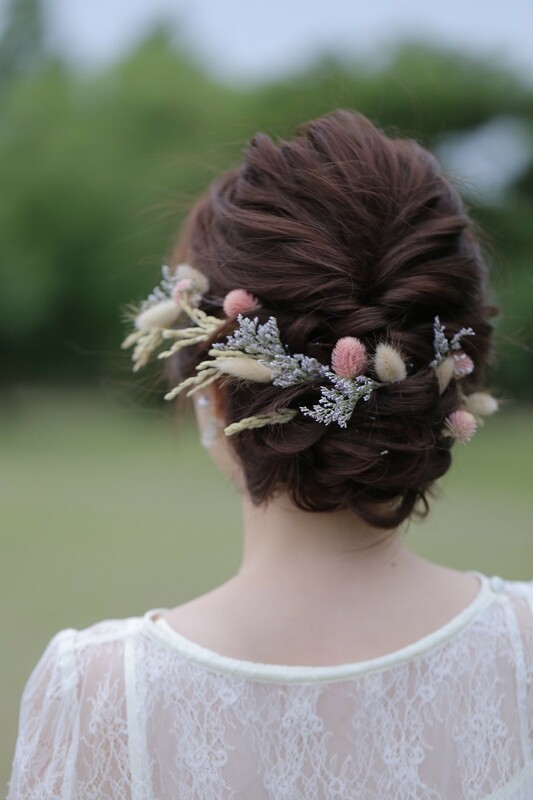 I was also a bit picky when it came to my hair and bouquet as well so about a month before our photo shoot, we asked a friend, and they made the accessories and bouquet out of the rice stalks! What really left an impression on you? The atmosphere of the photo shoot was fantastic! We decided to have the photo shoot at my husband's family's home. You can't see them, but 15 of my fiancé's relatives came to help us with the shoot! It was so fun to have everyone involved and our photographer really liked the idea too so it really felt as if we were home. My favorite part of the photo shoot was when we got to dress in more normal clothes and get down in the mud haha! Since it's the year of the rooster, we wanted a picture to commemorate the year we were getting married in. To show it, we got small little bird props to add to our photo shoot. Yusuke said "Pretend like you're eating the birds!!" And we got this funny shot, it's one of our favorites (haha). We were absolutely ecstatic to be able to work with such a great photographer. He really listened to all of our requests, especially our want for such unique and interesting photos. Giving off such a relaxed and fun atmosphere, the photo shoot was a huge success and our family really enjoyed it! From kimono to wedding dress! 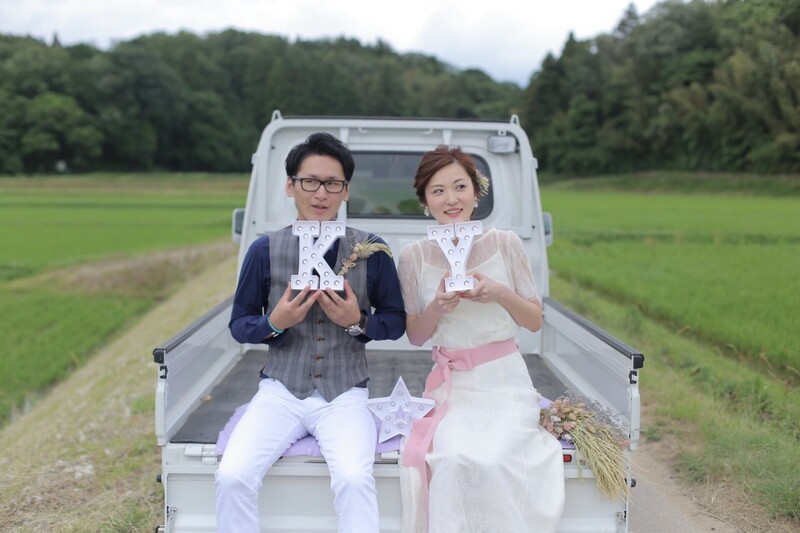 With a beautiful wedding dress and bouquet made with the rice stalks the couple take photos in their wedding attire ♡. Kaleb is also wearing a boutonniere made of rice stalks. 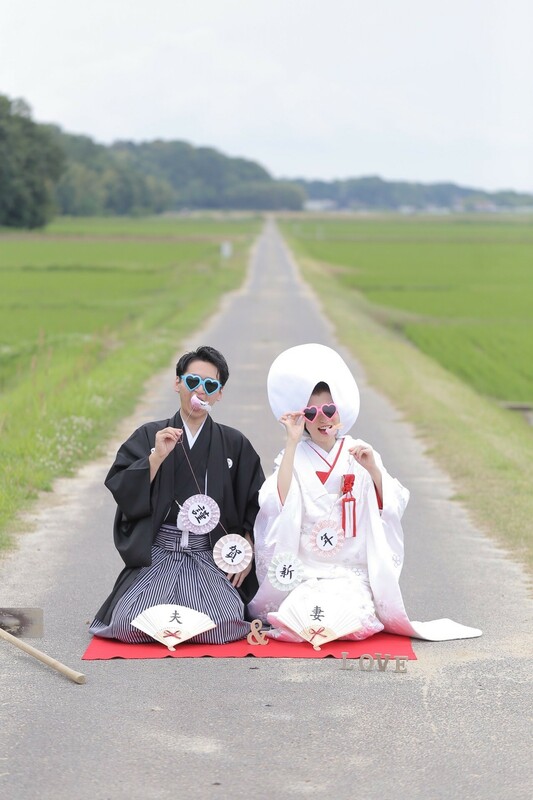 The rice-themed accessories make the couple a picture-perfect match. 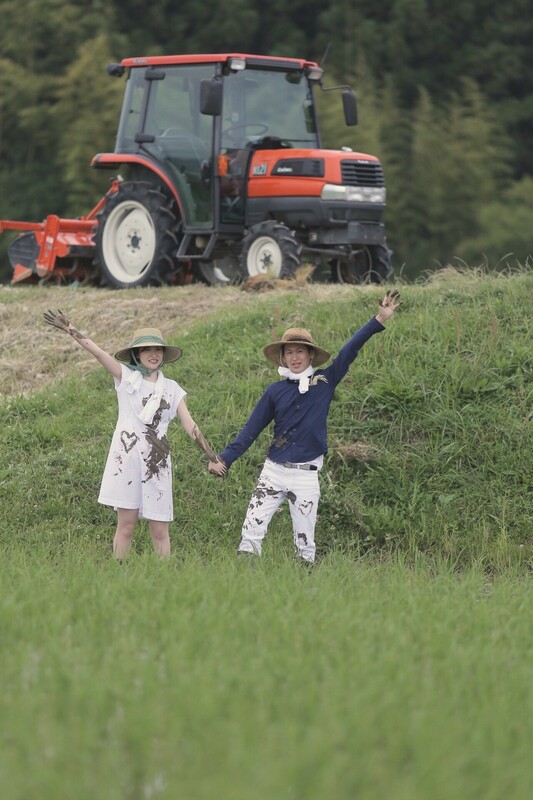 The couple really wanted a few photos of themselves in the rice fields so Yue found a simple cheap white dress that could be worn in the mud! With a cute playfulness in their movements, the couple took these fun shots in the mud. Yue: With two different outfit changes, the photo shoot took about 6 hours in total. Considering the long hours, having a place for us to take breaks was of utmost importance. Since the photo shoot was really close to the my fiancé's house having a resting and changing place was very easy. I really recommend finding a place for breaks during your photo shoot! A cute shot of Kaleb's family chasing after the runaway couple!